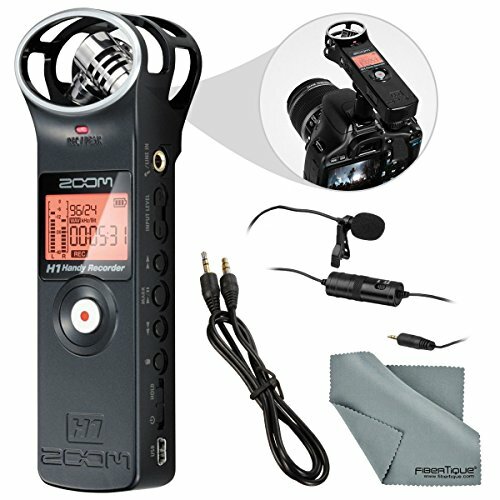 Designed for musicians, journalists, podcasters and more the Zoom H1 is a recorder that provides high-quality features in a compact, portable design. The H1 will amaze you with its ability to record WAV and MP3 up to 24-bit/96 kHz and will let you capture stereo recordings with incredible accuracy and realism thanks to its stereo X/Y microphone configuration. Record to microSD and microSDHC memory cards with capacities up to 32GB and use the built-in speaker to listen to your recordings right away. With the H1 you can forget the trouble of navigating complicated menus using the simple interface that provides1-button recording,physical controls for playback functions, input and volume levels, low cut filter and auto level control. The H1 always records at a level that is just right with minimal unwanted noise with its Auto Gain Control and Low-Cut Filter and provides a 3.5mm In and Out as well as a high-speed USB 2.0 port. Operating on just a single AA battery for up to 10 hours the Zoom H1 is the ideal ultra-portable audio recorder. Lavalier Microphone - Omnidirectional mic provides full 360-degree coverage and features an integrated cable to connect to the recorder. Records WAV and MP3 up to 24-bit/96 kHz for high-quality audio. Stereo X/Y microphone configuration captures stereo recordings with incredible accuracy. Records to microSD and microSDHC memory cards with capacities up to 32GB. Features built-in speaker, 3.5mm I/O, USB 2.0 port, threaded tripod mount socket and operates on 1 AA battery for up to 10 hours. For an upgraded recording package the bundle includes a professional omnidirectional lavalier microphone.